The Banaue Rice Terraces are a National Cultural Treasure of the Philippines and are considered to be the 8th Natural Wonder of the World by many Filipinos. The terraces are carved in the mountains of Ifugao and were most likely done by hand. 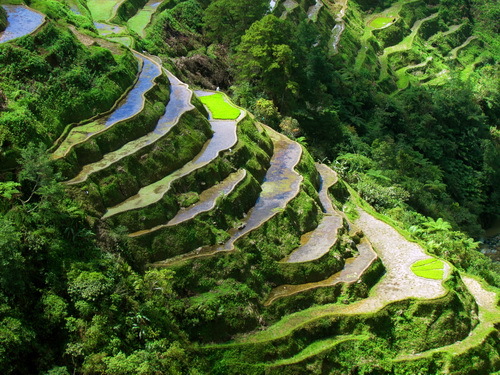 There have been rice terraces in the mountainous regions of Ifugao and northern Luzon Island for over 2,000 years. The terraces were first constructed as a practical solution to the problem of growing rice on land that falls away in front of you at vertigo-inducing angles. The terraces soar to around 1500m above sea level and, since they are located in one of the most remote parts of the Philippines' main island of Luzon, it takes a bit of a trek to get there, a fact that seems to deter the usual cavalcade of coach-bound tourists. The business traveller in search of a little refreshment for the soul may find the effort well worthwhile. The most popular place to look at the rice terraces is called the Sunrise Viewpoint, where local Igarot tribes people pose for photographs and sell wood carvings. But it is also possible to set out on foot along the pathways across the rice paddies, their banks scattered with scarlet wild flowers that contrast spectacularly with the vivid green of the rice plantings. It is best to hire a guide if you want to adventure yourself in the rice terraces as you might get lost otherwise. These mountain hikes can take hours but the views of the terraced valleys are breathtaking and in one or two places there are waterfalls and natural swimming holes where one can ease away the aches and strains of the hike. The rice terraces here were declared in 2009 free from any genetically modified organisms. Farming in the area is carried out much the same way it was carried out hundreds of years ago. The terraces can be visited anytime of the year but the best time for a visit is between February and March when the cleaning and planting time occurs and between June and July when the harvest occurs. 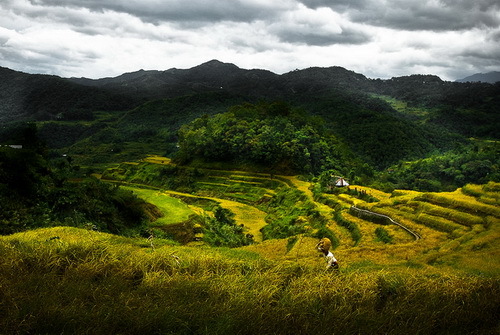 At the nearby Batad Rice Terraces, the best time to visit is between April and May and October to November.